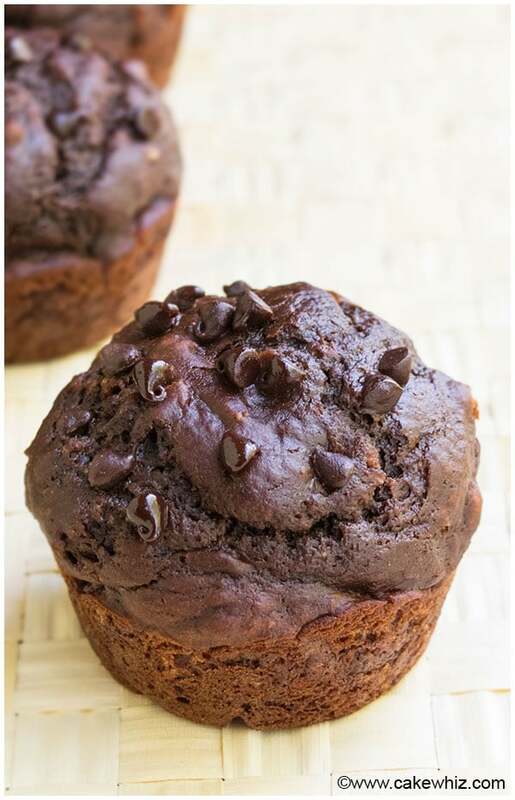 Quick and easy healthy double chocolate muffins recipe, made with simple ingredients. 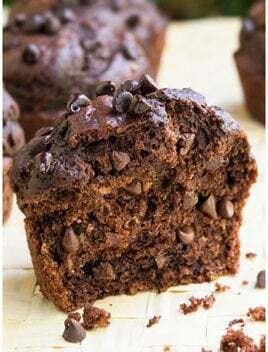 These low fat chocolate muffins are soft, moist and freeze well too! 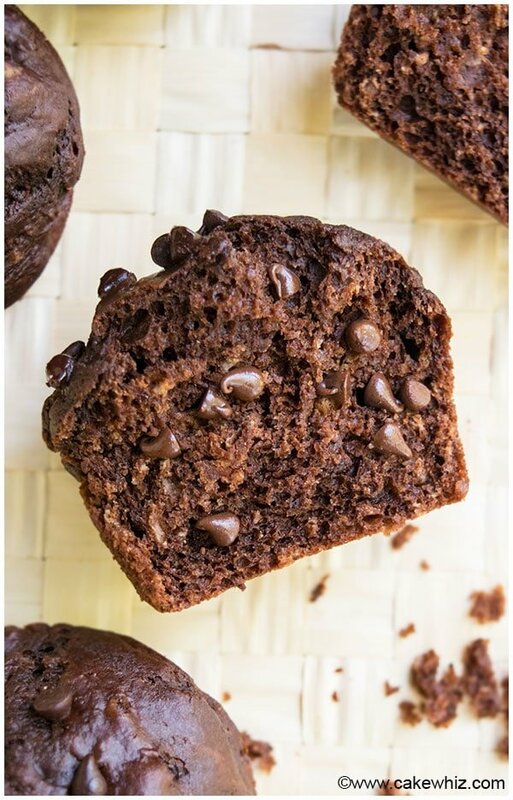 It’s not often I find something that’s choco-licious and healthy – but these healthy DOUBLE chocolate muffins hit the mark on both accounts! You can also call them SKINNY chocolate muffins. These simple chocolate muffins don’t require much time and the ingredients to prepare…I actually had everything on hand already. 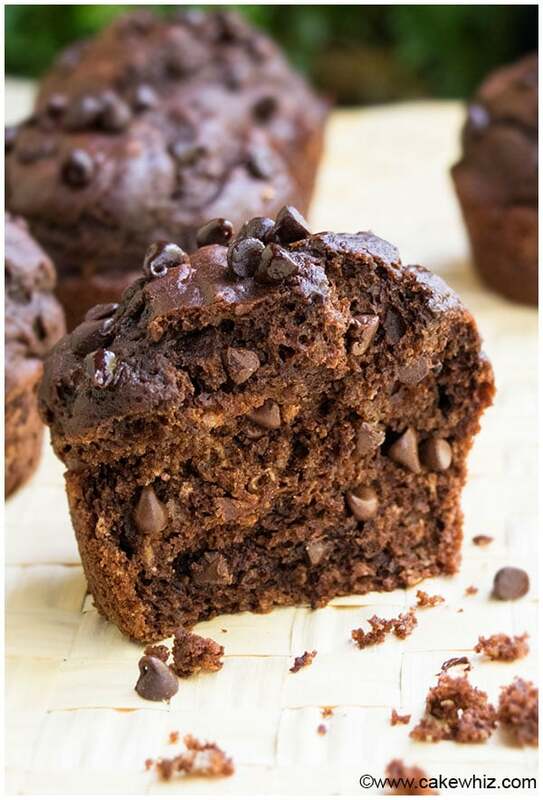 As if this low calorie healthy chocolate muffins recipe wasn’t great enough, you can adjust the recipe to make it even healthier or add a different taste and texture. Mix the ingredients but DO NOT over mix. Just mix until ingredients are combined and then stop mixing, even if there are lumps. DON’T replace all-purpose flour with any other flour because the texture will change. GREASE your muffin pan with coconut oil for other added health benefits. For bananas, the riper they are, the better and sweeter they are. This also helps use up those brown bananas no one in the house will eat. If you are including any ADD-INS, make sure to add these last and then give the batter one more gentle stir to mix them in. Again, DO NOT over-mix or else you will end up with tough glutonous muffins. Make sure NOT to OVER-FILL your muffin cups so they don’t spill over when baked. I usually fill each cup about ¾ full. This gives them enough room to rise. Use an ice cream scoop to add muffin batter into the cupcake pan. This way, all your muffins will be equal in size. Muffins are best the same day they are made, but you can STORE them in an airtight container at room temperature for another day. Add in ½ cup of nuts. I like to use crushed pecans or walnuts. Make double chocolate orange muffins by adding in 1 tbsp orange zest and add an orange drizzle topping. Make double chocolate cherry muffins by adding in 1/3 cup chopped, dried cherries into the batter. You can also add dried raspberries or cranberries. Make sure to coat them in flour to prevent them from sinking to the bottom of the muffins. Check out this post on how to stop chocolate chips sinking for tips. REPLACE the semisweet chocolate chips with ½ cup of white chocolate chips to make white chocolate muffins. Drizzle a simple raspberry glaze on top of the muffins for double chocolate raspberry muffins. Add a chocolate glaze on top to make TRIPLE chocolate muffins. Try adding in ¾ cup peanut butter for a peanut butter, chocolate chip muffin – mmm! Or you can just spread peanut butter on top of these muffins. How about adding a coffee glaze to the top of these muffins? Check out my mocha syrup recipe. Use a MINI muffin pan to make mini double chocolate muffins from scratch. This way you can eat more than one and not feel guilty because you know they are healthy. How do you make double chocolate muffins? Mix together egg, sugar, applesauce, vanilla and bananas. Add flour, baking powder, baking soda, cocoa powder into the wet mixture and mix until just combined. Stir in chocolate chips. Bake and enjoy! In a mixing bowl, add egg, yogurt, coconut oil, bananas, brown sugar, vanilla extract, cinnamon powder (optional). Mix these ingredients together. Add flour, cocoa powder, baking soda and mix just until combined. DO NOT OVER-MIX! Stir in chocolate chips that have been coated in flour. Pour mixture into a greased cupcake pan. Bake at 350 degrees for 20-22 minutes or until an inserted toothpick comes out clean. Enjoy! Leftovers can be stored in a sealed container in the fridge for up to 3 days. They can also be frozen in sealed freezer bags for up to 1 month. Is the nutritional info based on 1 muffin or for all 12? Like per serving is that per muffin? 1 serving is 1 muffin. So, the nutrition info is for 1 muffin.